Ministry of Propaganda - 27/Apr/2006: "Licence Please!" No, not the TV Licence this time (although there was yet another letter waiting when I returned from my holidays). This time we're talking driving licences, or to be precise, pictures on driving licences. 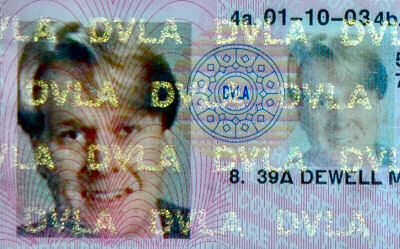 MC Winkel over in Germany is collecting driving licence pictures (via Spreeblick). Thought I try to get this meme into the UK blogosphere, let's see if anyone else joins in. My picture(s) on the right (we get two here in the UK, not sure why). As picture licences in the UK are only valid for 10 years and I had to renew my licence after moving house in 2003 my picture is comparably recent (but certainly not from 2003, more like late 1990s). The picture from my original licence (that would have been somewhere around 1986 or 1987) would have been much more embarrassing. And before you ask why I have a UK licence but a German passport: When I first moved to the UK in 1995 you had to exchange your licence after a certain period (I think 6 months or 1 year, can't remember exactly). As far as I know that's not necessary any more now. And after this interlude I better get back to the WalkIslay 2006 travelogue. The page for the journey to Islay is complete, today I hope to at least start the page for the first walk through Islay's Great Glen.